Sometimes you just don't have the time or patience to go through your entire skincare regimen in the morning, and you can’t wait to get into bed after a long day at work. Or maybe you are confused by the sheer number of products out there and the steps involved — this is where Auolive comes in. And Au speaks from experience. Juggling a startup and motherhood is no easy task, and anyone who has been in her shoes will know how little time working mothers have for themselves — let alone skincare. The mum-of-one shares more in our interview with her below. sXs: We keep hearing about multiple-step skincare regimens. What makes Auolive as effective (or better) despite having fewer skincare steps? 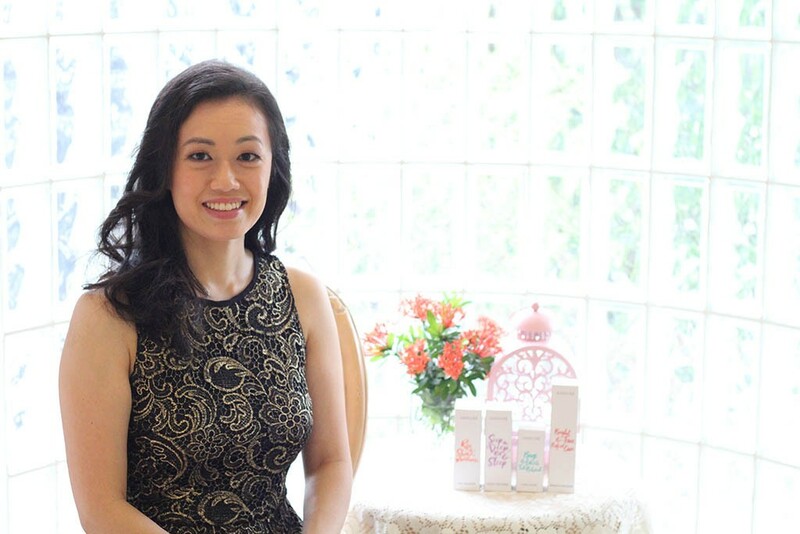 Claire Au: We worked with dermatologists and cosmetic scientists to ensure the efficacy of our products. After getting the reassurance, we had our products formulated in Switzerland to combine multiple benefits and functions in one bottle. sXs: Less is more for Auolive, but what are some skincare steps women should never forgo? Au: After cleansing, it is very important to moisturise and apply sunblock in the day. At the most basic level, a moisturiser protects the skin from external aggressors and keeps skin hydrated. As for sunblock, I cannot emphasise enough that the sun is one of the main causes of ageing — do not leave the house without it! Likewise, it’s a good time to moisturise and hydrate your skin at night as that’s when your skin is repairing itself. sXs: Auolive believes in giving back to society. What are the brand’s corporate social responsibility (CSR) efforts like? Au: Auolive is all about embracing women, and we focus on helping marginalised women in Singapore and regionally. For our first project, we partnered with a Singaporean couple who worked with single mothers in a village off Siem Reap, Cambodia. They are taught how to sew and make handicrafts, which they sell to make a living. sXs: Any plans in the pipeline for a larger range of products or physical retail store? Au: We have had a lot of enquiries for cleansers and masks, so those are in the pipeline. We are also constantly on the look-out to develop more multi-tasking products that work hard for women and save them time. As for retail spaces, we work with partners like TANGS and Naiise to carry our products. sXs: Prior to starting Auolive, you owned a fish soup stall — an unorthodox career choice for a degree holder. Tell us more about it. Au: After graduation, I got a corporate job in the luxury and skincare industry. However, while I’ve always been passionate about skincare, my desk job didn't feel fulfilling. Deep down, I wanted to have my own business, and my entrepreneurial spark pushed me to pursue that dream. After all, if not now, then when? I was still young and had a great family fish soup recipe in hand as well. But I didn’t want to “kill” myself financially with the high costs of opening a restaurant or café, so I decided to open a humble hawker fish soup stall instead. It was financially more manageable for a 25-year-old. My dad (Boyd Au) is a successful entrepreneur, and he always taught us that all businesses need to have a Differentiating Value Proposition — as an entrepreneur, you need to know how your business brings something different that is of value to the customer. sXs: What’s your biggest takeaway so far from your entrepreneurship journey? Au: My dad taught me a very important lesson — don’t be afraid of the giants. Auolive is in a hyper competitive industry, but I believe that as long as we’re able to differentiate ourselves, persevere and offer customers solutions that address their needs, there’ll be demand for our skincare products!